The Reverse Supply Chain is a defined strategy and support process, designed to incent the service engineer or customer to return the used product (core) to a centralised collection point, enabling the remanufacture of the product (core). 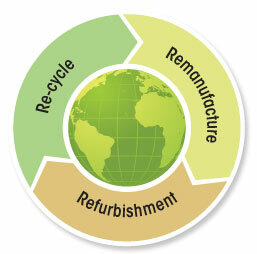 Any remanufacturing program is only as effective as the Reverse Supply Chain and a robust and efficient remanufacturing process allows. Experience shows that in some cases core returns on established remanufacturing programs can yield as little as 30% of current demand. Not only the return of the used product (cores) but their condition on receipt is also critical to deliver a profitable remanufacturing programme. APDI Ltd offer full control of the return stream by working with Customers carriers or by independent means, to maximise returns and core condition to ensure that effective, productive remanufacturing is viable. Many options exist to stimulate core returns. Selection of the correct method(s) depends on the Customers Supply Chain strategy (Internal service operations vs Third Party service etc). This can be fully explored and the most effective strategy selected during project development. Cores can be directed back to Customers warehousing or direct to APDI ready for order placement and reprocessing.